US Secretary of State Rex Tillerson suggested yesterday that talks with North Korea over its nuclear and ballistic missile program might be possible if Pyongyang halted its missile testing. His comments came after the UN Security Council on Saturday imposed harsh new economic sanctions on North Korea over two missile tests last month. He suggested that “the best signal that North Korea can give us that they are prepared to talk would be to stop these missile launches,” adding that “other means of communication” were also open to Pyongyang. While Tillerson has previously suggested that negotiations could take place, his remarks yesterday, outlining a specific precondition, were the strongest hint yesterday that the US would engage in talks. Tillerson, however, has also said any negotiations must involve a commitment by North Korea to abandon its nuclear and missile programs, which the Pyongyang regime has declared previously it will not do. 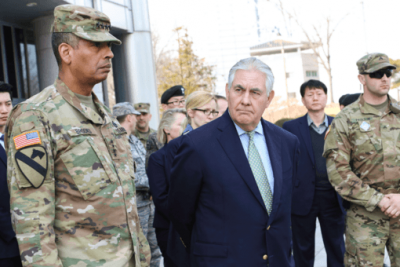 Yesterday’s comments followed a statement last week, in which Tillerson appeared to offer security guarantees to North Korea. He told the media in Washington the US was not seeking “regime change,” the collapse of the Pyongyang regime or “an excuse to send our military north of the 38th parallel” into North Korea. The US and South Korea are still technically at war with North Korea. The Korean War, which cost the lives of millions, ended in 1953 with an armistice, not a peace agreement. At the top of the list of Pyongyang’s demands has long been a peace treaty with the US and the normalisation of relations that would allow it integrate into global capitalism. North Korea has every reason to be suspicious of Tillerson’s offer, not least because of the ongoing political infighting and turmoil in Washington. While the secretary of state is suggesting talks, H.M. McMaster, Trump’s national security adviser, emphasised over the weekend it was “impossible to overstate the danger” posed by North Korea and all options, including military strikes, were on the table. Moreover, Pyongyang has had bitter experience in past negotiations over the nuclear issue. On two occasions, in 1994 and 2007, North Korea agreed to give up nuclear programs in return for various US promises, including diplomatic relations, that were not honoured. The 1994 Agreed Framework guaranteed two nuclear power reactors to North Korea that were never delivered before President George W. Bush finally scuttled the pact. The 2007 agreement, following North Korea’s first nuclear test, collapsed after Bush arbitrarily demanded additional safeguards and inspections. Such bluster only hands Washington a pretext for its continued military build-up in the Asia Pacific not only against Pyongyang but also Beijing. North Korea’s limited nuclear arsenal provides no protection against the US, which has said any attempt by Pyongyang to use its weapons would result in annihilation. The Pyongyang regime, which is among the most isolated in the world, is under enormous pressure to bow to US demands to abandon its nuclear and missile programs. China, which is by far North Korea’s largest trading partner, voted for the UN sanctions and has implemented previous ones that have already impacted on the economy. The latest bans on North Korean exports of coal, iron ore, lead and seafood are expected to slash the country’s export trade by $1 billion, or about one third. At the same time, Wang called on the US and South Korea “to stop increasing tensions” and appealed for all parties to return to the negotiating table. China opposes North Korea’s nuclear program because the US has used it as an excuse to expand its military presence in North East Asia. Beijing also fears that Japan and South Korea could cite it as a pretext to develop their own nuclear weapons. Yet, China does not want to create an economic and political crisis in Pyongyang that could lead to an intervention by the US and its allies into North Korea. All the hints, suggestions and appeals for negotiations rather than war are very tentative and may come to nothing, given the internal tensions, unpredictability and recklessness of the Trump administration. While Tillerson is hinting at talks, the drum beat for military strikes against North Korea continues in the US media and political establishment. Former US ambassador to the UN John Bolton, who is well-known for his right-wing, militarist views, wrote a comment in the Wall Street Journal last week entitled “The military options for North Korea.” In the absence of a diplomatic solution, he urged American politicians and generals to prepare for pre-emptive military strikes, ranging from hitting North Korea’s military and nuclear facilities to assassinating its leaders. Bolton, however, is simply urging what is already under close discussion in the Pentagon and CIA. At the Aspen Security Forum last month, as Bolton noted, Joint Chiefs of Staff chairman, General Joseph Dunford ruled out allowing North Korea to have a nuclear arsenal capable of hitting the US. Dunford affirmed it was his job “to develop military options to make sure that doesn’t happen.” At the same forum, CIA director Mike Pompeo suggested the intelligence community was developing “a wide range of options for the president” to “separate” North Korea’s nuclear weapons from its leadership—that is, to eliminate key North Korean leaders.